Hundreds of bikers trek down Highway 22 to saloon where young father worked as cook. 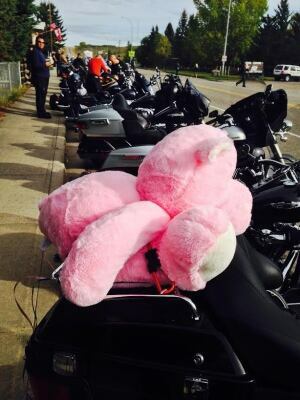 About 200 bikers gathered in Longview, Alta. on Saturday to make a 130-kilometre ride down the Cowboy Trail to the Crowsnest Pass area in honour of toddler Hailey Dunbar-Blanchette and her father Terry Blanchette. The motorcycle convoy rode down Highway 22 to the Pure Country Saloon in Frank, Alta., where Blanchette worked in the kitchen. Blanchette, 27, was found dead in his home on Monday, with his two-year-old daughter missing. That triggered an Amber Alter across three provinces and Montana. 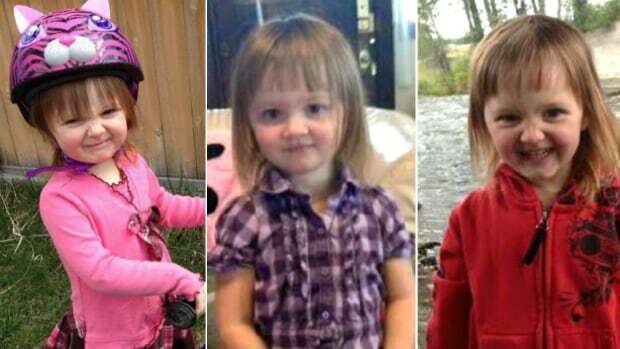 The toddler's remains were discovered on Tuesday in a rural area of Blairmore, a community in the Crowsnest Pass. Derek Saretzky, 22, of Blairmore has been charged charged with two counts of first-degree murder and one count of indignity to a body. One of the bikers taking the ride Saturday, Bill Fenton, said he was touched by the news of the deaths. "The reason we're here is tragic. And I would rather do what I'm doing now, and try to help in some small way — and at least let the victims know that they're not grieving alone — than succumb to the actual rage that I felt for quite a while too," he said. "That's just not healthy for anybody. That's the reason we're here, is we're just trying to help." The saloon is accepting donations for funeral expenses for the father and his two-year-old daughter. The money will also be used for a memorial park bench at a playground where Hailey liked to use the swings. Those arrangements are expected to be announced within the next few days. Saretzky is in police custody and will next appear in court in Lethbridge on Sept. 23. The Municipality of Crowsnest Pass encompasses Blairmore, Coleman, Hillcrest and Bellevue, as well as the historical site at Frank Slide.